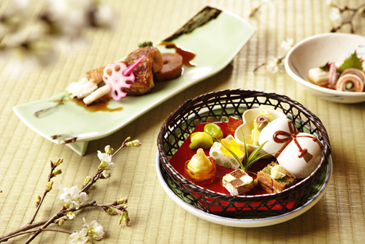 Guests of the Grand InterContinental Seoul's Japanese restaurant, Hakone, can experience the flavors of spring in celebration of this season of cherry blossoms until April 30, 2006. An extraordinary 10-course menu featuring a variety of sashimi and sushi as well as fried dishes using fresh spring vegetables as ingredients has been planned. This type of presentation is known as "kaiseki" in Japanese referring to the highest quality of traditional Japanese cuisine. In addition to the Kaiseki Sakura set menu, a variety of a la carte items are also available such as Braised snapper with glutinous rice and vegetables, Grilled lobster with soybean paste, Broiled sea bream with bamboo shoots, and Thinly sliced sea bream sashimi.